TEMPLE BAR, Arizona — The peregrine falcon can target prey up to a mile away and dive on it at more than 200 mph, faster than any other animal on Earth. 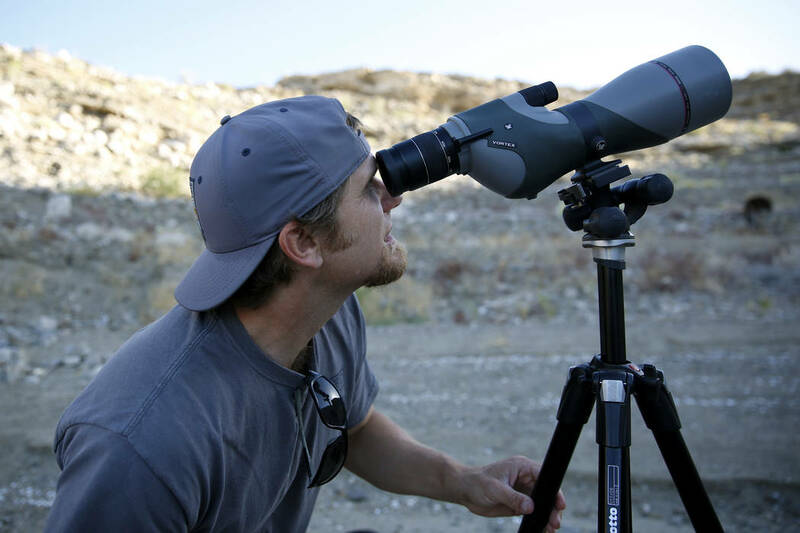 Andrea Cornejo/Las Vegas Review-Journal Joe Barnes, a biologist with the Nevada Department of Wildlife, examines a peregrine chick near its nest on a ledge overlooking Lake Mead in Temple Bar, Arizona, on May 16. 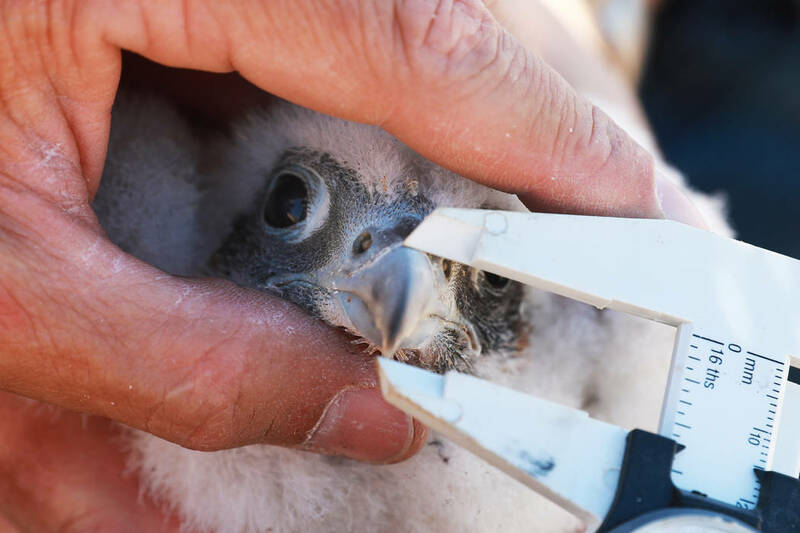 Andrea Cornejo/Las Vegas Review-Journal A peregrine chick looks around in Temple Bar, Arizona, on Wednesday as Joe Barnes, a biologist with the Nevada Department of Wildlife, weighed and measured the chick, collected samples of its feathers and fit a metal identification band around a leg. 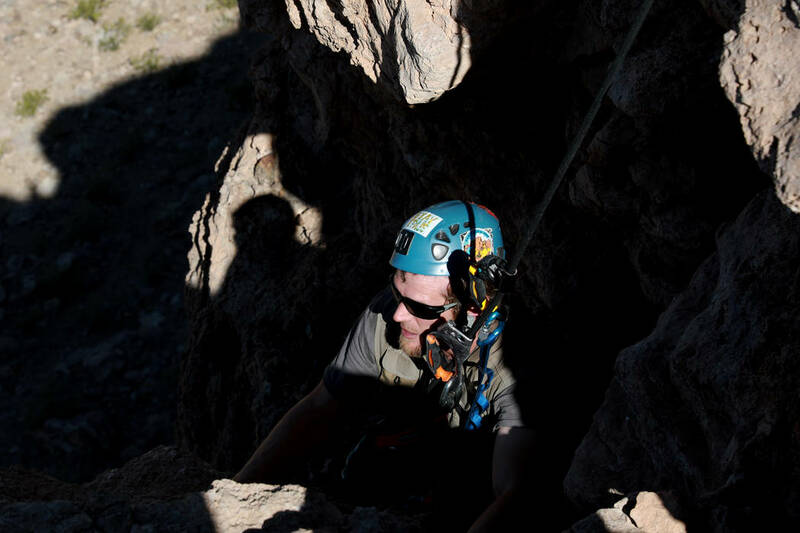 Andrea Cornejo/Las Vegas Review-Journal Joe Barnes, a biologist with the Nevada Department of Wildlife, prepares to climb 50 feet down to collect peregrine chicks from their nest on a ledge overlooking Lake Mead in Temple Bar, Arizona, on May 16 so they can be weighed, measured and identified. Andrea Cornejo/Las Vegas Review-Journal Joe Barnes, a biologist with the Nevada Department of Wildlife, climbs 50 feet down to collect peregrine chicks from their nest on a ledge overlooking Lake Mead in Temple Bar, Arizona on May 16. Andrea Cornejo/Las Vegas Review-Journal Joe Barnes, a biologist with the Nevada Department of Wildlife, looks for a nest with peregrine chicks on a ledge overlooking Lake Mead in Temple Bar, Arizona, on May 16. Andrea Cornejo/Las Vegas Review-Journal Joe Barnes, a biologist with the Nevada Department of Wildlife, measures the bill depth and culmen of a peregrine chick on a ledge overlooking Lake Mead in Temple Bar, Arizona, on May 16. Andrea Cornejo/Las Vegas Review-Journal Joe Barnes, a biologist with the Nevada Department of Wildlife, retrieves a peregrine chick from its nest on a ledge overlooking Lake Mead in Temple Bar, Arizona, on May 16. Barnes weighed and measured the chick, collected samples of its feathers and fit a metal identification band around a leg. 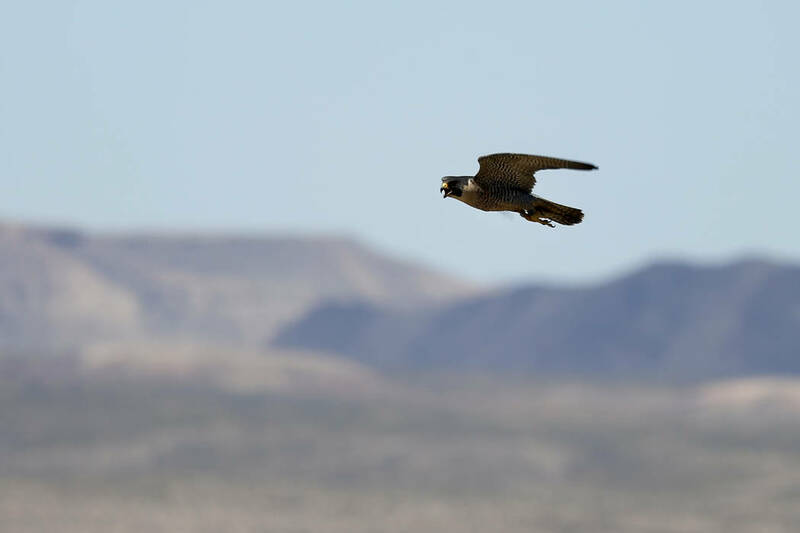 Andrea Cornejo/Las Vegas Review-Journal An adult peregrine falcon circles near its nest on a ledge overlooking Lake Mead in Temple Bar, Arizona, on May 16 as Joe Barnes, a biologist with the Nevada Department of Wildlife, gathered its three chicks so they could be studied. Andrea Cornejo/Las Vegas Review-Journal Joe Barnes, a biologist with the Nevada Department of Wildlife, drives a boat toward a ledge with peregrine chicks in Temple Bar, Arizona, on May 16. It’s hard to believe the gawky puffballs in Joe Barnes’ gym bag are even members of the same species. At almost 4 weeks of age, the three peregrine chicks look less like nature’s most advanced guided missile and more like a jumble of yellow legs and white down feathers. They stare up from the bag with wide black eyes and stunned expressions. 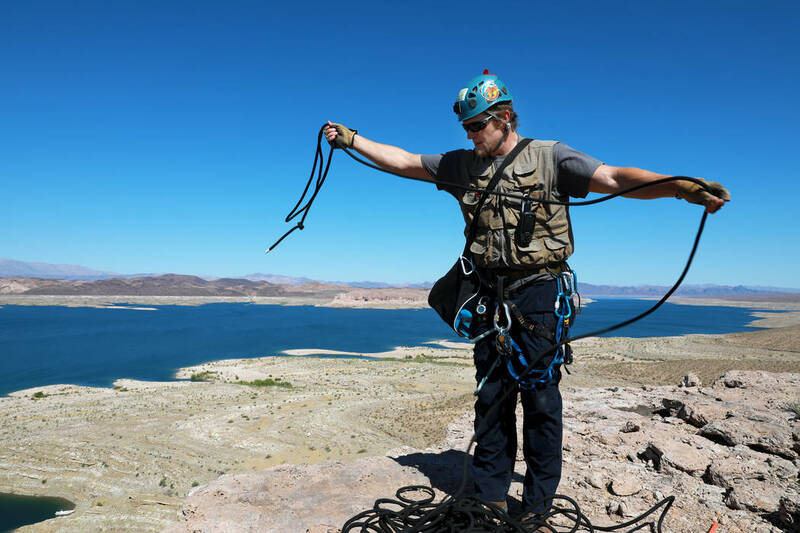 Barnes, a biologist with the Nevada Department of Wildlife, just rappelled 50 feet to collect the Nerf-football-sized birds from their nest on a ledge on a cliff overlooking Lake Mead. Over the next hour, he weighs and measures each of them, collects samples of their feathers and fits metal identification bands loosely around their legs before returning them to the nest. As he works, two adult falcons circle overhead, one male and one female, squawking anxiously. “They’re good parents. They don’t want you messing with their young,” he said. Barnes is in his 15th year working with peregrine falcons. 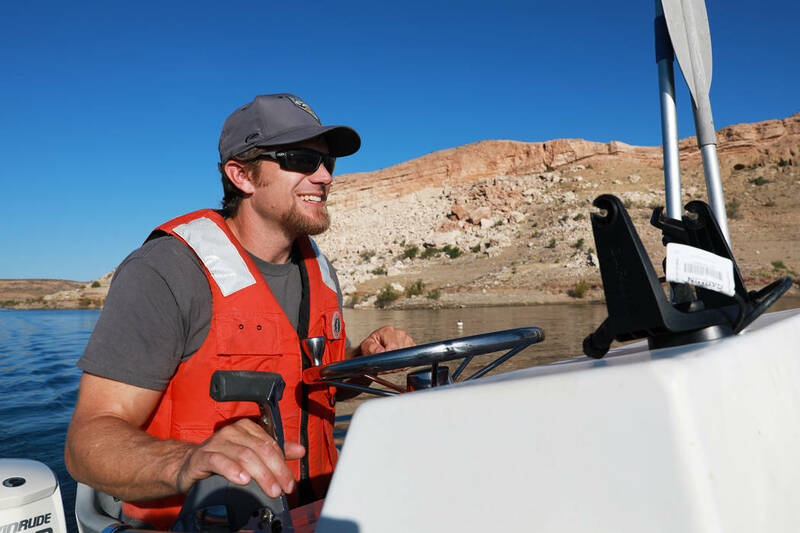 He started studying the once-endangered birds in 2004, while on staff at Lake Mead National Recreation Area. 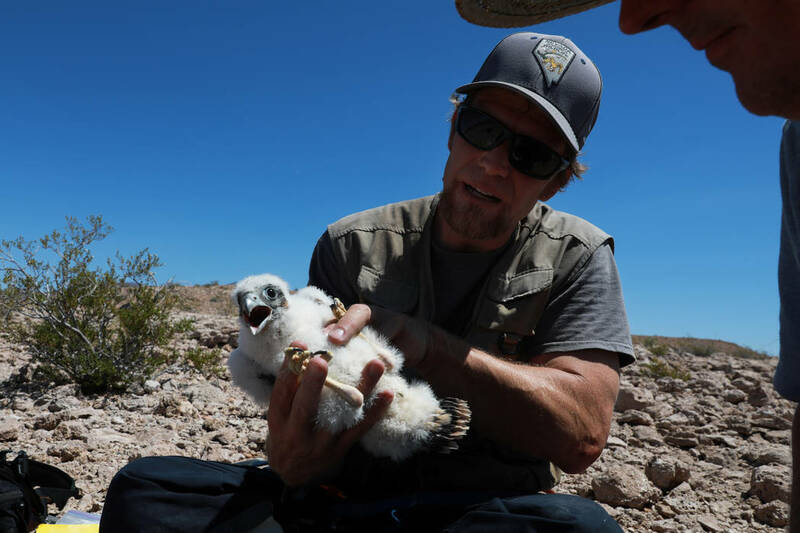 He said his first several years of research mostly involved “stomping around every mountain range and every cliff” in search of peregrine nests and territories within the 1.5 million-acre recreation area. In 2012, he started banding the birds and sampling their feathers for signs of mercury and other pollutants. Last year, he added genetic testing to the mix in hopes of tracking the birds’ movements and lineage. Barnes also monitors falcons elsewhere in Nevada. The birds represent a major success story for the Endangered Species Act. Peregrine falcons can be found on every continent except Antarctica, but in North America and parts of Europe they were nearly wiped out by the advent of DDT and similar pesticides in the 1950s. The same environmental contaminant also pushed the bald eagle to the brink. By the time researchers figured out the cause, peregrines were gone from the eastern U.S. and their numbers elsewhere had declined by 95 percent. “It was pretty dire. It really was,” said Barnes, who also studies eagles and other birds of prey. The peregrine was added to the endangered species list in 1970, but its numbers didn’t begin to rebound until after DDT was banned two years later. By 1999, the population was healthy enough to be removed from the endangered list. 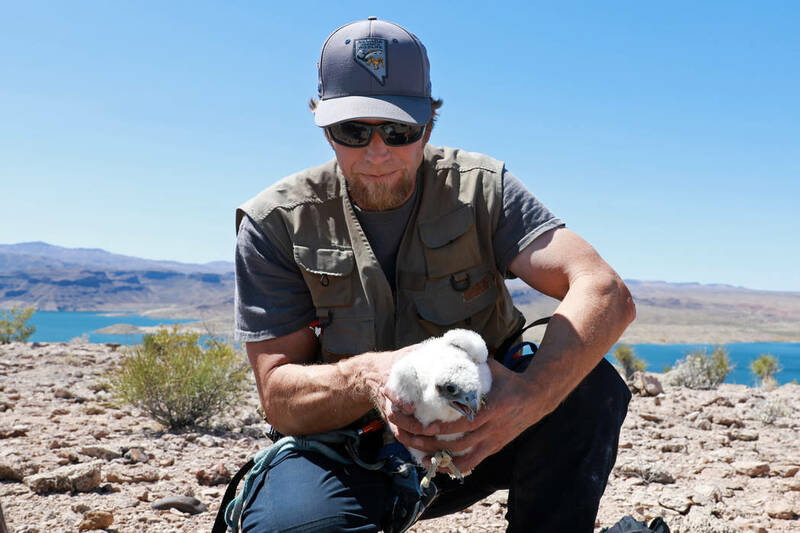 Based on his research, Barnes believes the peregrine has fully recovered — and then some — across Southern Nevada. In parts of Lake Mead where there were no recorded sightings prior to 1985, the birds have now reached “carrying capacity,” he said. Barnes usually has an assistant with him in the field, especially when he rappels down cliffs to collect and examine nestlings. Due to a last-minute cancellation, his assistant on this recent Wednesday is a reporter. 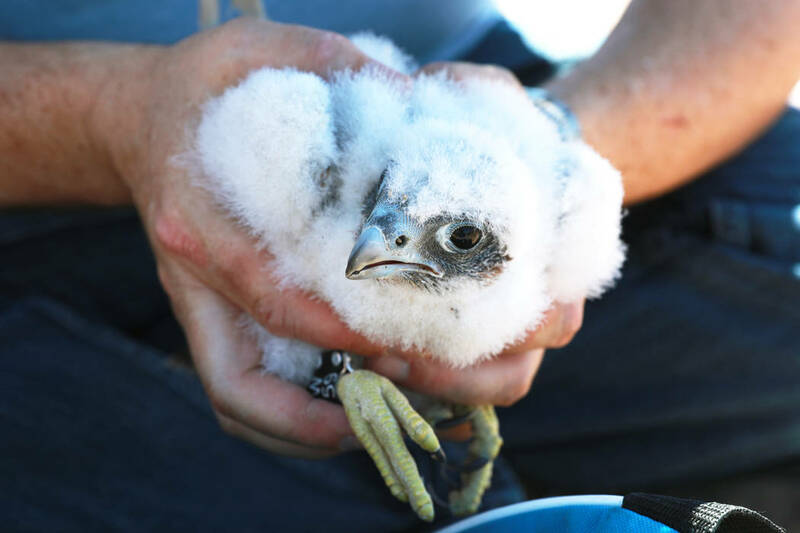 Here’s what you can learn about a young peregrine falcon by holding one in your hands: Even at just a few weeks old, it is surprisingly strong, with sharp talons and powerful legs. You can feel its heart thump and the heat of its body beneath its downy coat. Upon closer inspection, you can see its first brown and white adult feathers poking out from the white fluff at its tail and wings and the corners of its eyes. Once every few minutes, one of the chicks will begin to squawk — perhaps in response to Barnes plucking a few feathers from its chest or crimping a numbered band around its leg — and its siblings in the gym bag will join in the chorus. The adult birds answer the call but keep their distance. Some parents are more protective than others, Barnes said. Another time he found himself hanging from a rope in front of a nest when the mother bird latched onto his arm and bit his hand to keep him from scooping up her brood. “I’ve lost a little blood,” Barnes said. Among the things he has discovered about falcons: They are hunters of opportunity that feed on a wide variety of prey, mostly other birds. From the nests he studies, Barnes has collected the remains of more than 100 species of prey — ranging in size from tiny hummingbirds to large cormorants and Canada geese. And peregrine falcons have extremely high “nest fidelity,” he said. Once they establish a territory, they tend to return to the same cliff or specific ledge year after year to raise their young. This particular trio of nestlings should be ready to fly on their own after three weeks or so. Typically, they will stick close to the nest for several months after they fledge so their parents can continue to feed them and teach them to hunt. 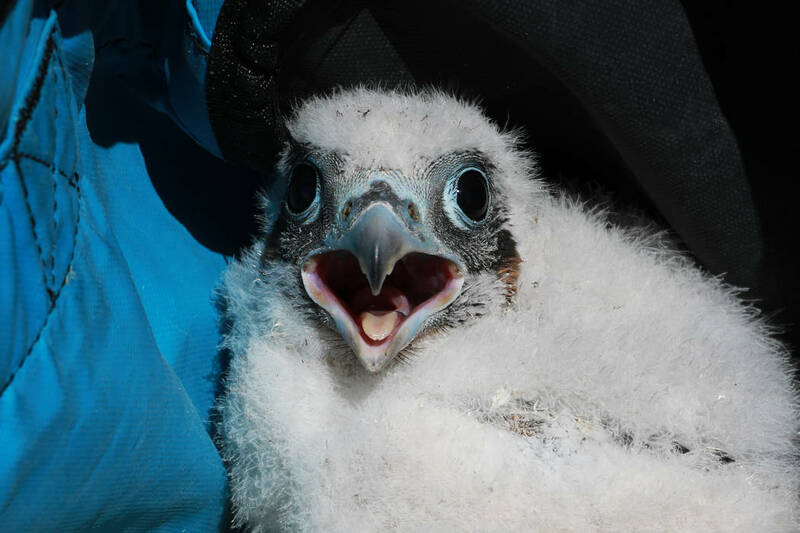 Little is known about the peregrine life cycle from about 2 years old until it finds a mate and establishes a breeding territory, Barnes said. “The next step would be to actually put transmitters on them, but that costs money,” he said. Ironically, the bird’s improved status has made studying it more difficult. You also can’t be too picky about who you use as an assistant. 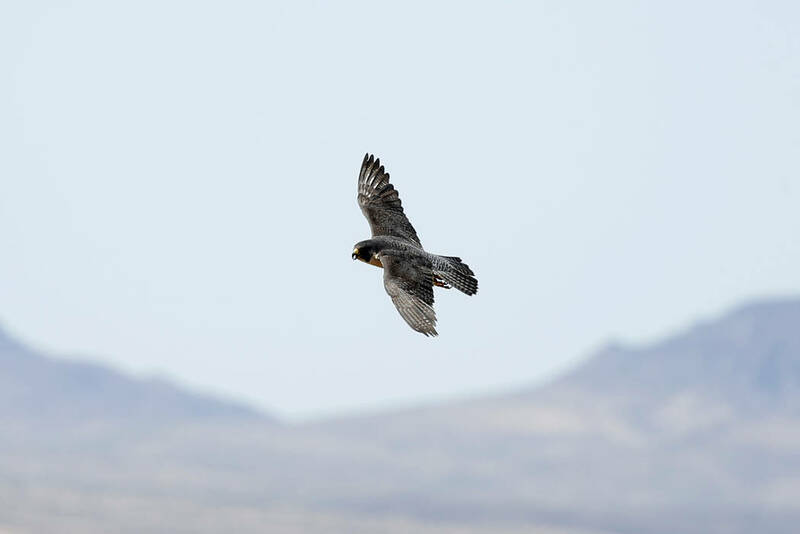 Peregrine falcons are found all over the world, including Lake Mead and elsewhere in Nevada. Adult peregrines stand 14 to 19 inches tall with a wingspan of 3 to 4 feet. The females are significantly larger than the males. The bird hunts by “stooping,” or dropping on its prey from above, with its wings closed, which enables it to reach speeds of more than 200 mph. Prey includes a wide variety of birds and bats. Peregrines typically nest on high cliff ledges, producing one clutch of two to five chicken-sized eggs a year. The eggs take about a month to hatch, and the young take about six weeks to fledge. Pesticide exposure caused the bird’s population to crash between 1950 and 1970, but recovery efforts led to its removal from the endangered species list in 1999.